Fuel for oil field operations arrived on the North Slope by barge instead of by truck last week, Aug. 30, for the first time. Colville, the company that contracted the barge, supplies about 90% of the refined fuel for oil field operations on the North Slope. 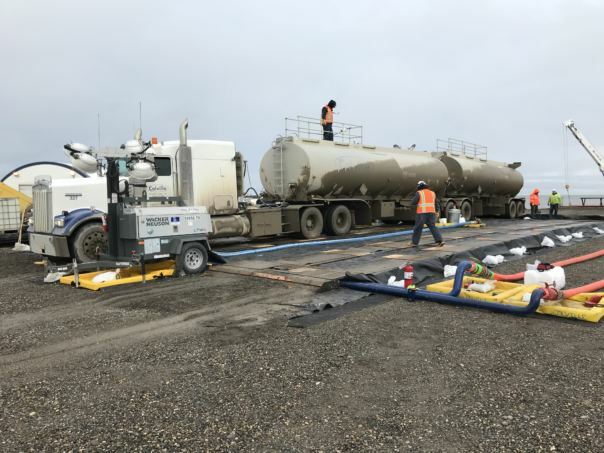 “The industry demand has increased and is anticipated to increase and so a fuel barge is a way to augment our trucking operation and the ability to transport fuel up to our customer,” Colville CEO and President Dave Pfeifer said. There’s an increasing number of big oil projects being planned and developed on the North Slope right now, especially west of Prudhoe Bay. That’s where companies like Conoco have made large oil discoveries recently. Pfeifer says that bringing fuel up by barge is now possible due to declining sea ice. “The Beaufort Sea has been in the last few years particularly accommodating with a lesser ice floe, which has allowed the ability for barges to come in that hadn’t been in years past,” Pfeifer said. Preifer expects barging to become a regular part of the company’s fuel delivery system, and perhaps even increase in the coming years. Colville typically delivers 20 million gallons of fuel to the North Slope a year, which requires about 2,000 truck deliveries. One barge delivery is equivalent to that of 200 trucks. Pfeifer says that Colville’s interest in barging stems in part from a 2015 event where ice and water flooded the Dalton Highway from a nearby river and held up transport. Pfeifer says that barging will provide the company another way to get fuel to the North Slope should something like that happen again.